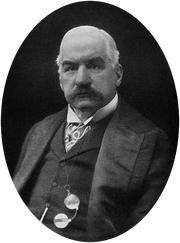 J. P. Morgan Source: Images of American Political History, public domain. Nikola Tesla had money problems almost all his life. The most damaging were during the building of the Wardenclyffe tower which was supposed to generate wireless energy. J.P. Morgan was helping fund the project but got impatient and pulled out. Another time that Nikola Tesla had money problems was when Westinghouse was going bankrupt and Tesla decided to help his friend out by not taking the profits. If he hadn't given up his share for Westinghouse, Tesla would have become a multi-millionaire and he would have had the funds to do more research. — Author and Tesla expert, Marc J. Seifer, talks about the relationship between Tesla and Morgan. Source: https://www.youtube.com/watch?v=fBE2_fT9-Zw. grand-nephew and only living relative of Tesla. Above: The Electrical Experimenter article on September, 1917. The Article depicts the destruction of the famous Tesla Tower, erected at Shoreham, Long Island, New York. Tesla wanted to transmit electricity from a power plant in Niagara Falls to the world using his Tower.
" Tesla's experiments faltered when Morgan declined to invest more money. Tesla struggled on, mortgaging the property to raise cash. But by 1915 he was out of money, and the property went into foreclosure. He remained convinced that success had been at hand. It is a simple feat of scientific electrical engineering, only expensive, he wrote. Blind, faint-hearted, doubting world." — John Rather, New York Times, 2002. "At the height of the Wardenclyffe adventure Tesla wrote Morgan that '[m]y enemies have been successful in representing me as a poet and visionary.' In doing so, his enemies were accusing him of not solving the business and technical problems related to this project." — W. Bernard Carlson, author of Tesla: Inventor of the Electrical Age, quoting letter from Tesla to J. P. Morgan, December 11, 1903.